Walking around the Mobile World Congress (MWC) last week in Barcelona, I couldn’t decide whether I was at a mobile telecom show, a car show, a medical device show or a health and fitness expo. Turns out I attended all the above given how mobility is transforming consumer touching industries. Given the scale of the event (85,000+ attendees, 1,700 exhibitors, eight exhibit halls), the yearly gathering of all things mobile yielded products and services ranging from the useful to the useless. In the “useful” category, the FiLIP calls itself the world’s first “smart locator” and phone for children aged 5-11. It’s a combination GPS tracker worn on the wrist plus a phone that lets kids dial their parents via a single button. More to my taste is Brew Bot, which uses sensor technology to track how I’m brewing my favorite beer. Pick a type of beer, follow the instructions and let your smartphone prompt you when and how to add ingredients. But then there was the Oral-B Smartseries toothbrush that connects via Bluetooth to your smartphone to measure how much you brush and let you know of “problem areas”. Definitely a conversation and it certainly gives the term “Bluetooth” a whole different meaning. But the example of the connected toothbrush highlights a general theme: connectivity has leaked out of mobile telecommunications to turn cars, appliances, clothes, and a host of other physical objects into interactive devices. I saw applications that ranged from the useful to the banal to the downright creepy. Right now, technologists are driving the bus as we are in early days. However, a consistent thread I picked up in conversations is that technologists recognize that the next stage of mobility won’t be a feature/function dialogue with the consumer. It will pivot on how we communicate the benefits and the trade-offs inherent in a truly connected environment–a task for communicators able to tell stories and engage communities. As one might expect, conference speakers batted around a slew of numbers about worldwide mobile device penetration, network speeds, spending and the like. However, the figure on everyone’s lips was the $19 billion purchase of WhatsApp by Facebook versus $2.91 billion paid for Motorola by Lenovo. If there was any single figure that epitomized the shift in value in the mobile ecosystem, it was this one. 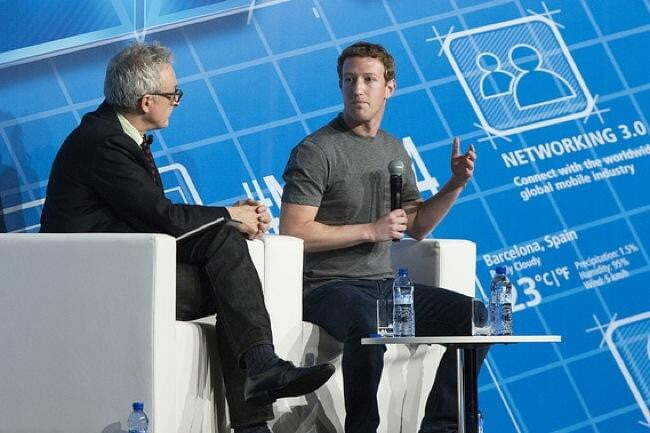 Mark Zuckerberg spent much of his keynote on the first day of MWC defending the lofty price paid by Facebook for WhatsApp, a company with around 50-60 full-time employees and 2013 revenue of $20 million according to media reports. While the jury remains out on the ultimate value of the deal, Facebook has cemented its position in messaging, which is often people’s first direct experience with the mobile Internet. That same day, WhatsApp CEO Jan Koum announced that the company would add free voice services later this year for its 450 million registered users, something that obviously didn’t have telecom executives dancing in the aisles. But WhatsApp wasn’t the only thing Facebook talked about in Barcelona. Making mobile data services more affordable for developing economies was another important thread. The social networking giant launched a non-profit called Internet.org in August 2013 along with Ericsson, Nokia, Qualcomm and Samsung. Its three areas of focus include making mobile data connectivity more affordable, optimizing mobile data use in emerging marketing, and creating new business models for mobile data that are native to developing countries. While the focus was on mobile data writ large, one of Internet.org’s first announced projects involved online education delivered via mobile for Rwanda. The pilot initiative is called SocialEDU, which aims to offer Rwandan students free access to Massive Online Open Courses (MOOCs) offered by universities like Harvard, MIT, ETH Zurich and others. Under the SocialEDU umbrella, Facebook will work with edX to build a social education app to access various MOOCs and connect students to each other. Airtel Rwanda will give free mobile data for education access for a year to any Rwandan participant. At the same time, Nokia will chime in with affordable smartphones. The Rwandan Government rounds out the SocialEDU project with fiscal policies (like trade-in rebates to upgrade devices, micro-loan guarantees for customers and more) as well as technical help by expanding its Smart Kigali program to offer free Wi-Fi in campuses throughout the country. It’s still early days but many of the right players are involved. Closer to home, I checked out Washington’s contingent to the MWC. For the past three years, the International Trade section of the Office of Economic Development and Competitiveness hosts a group pavilion where local companies can exhibit and network at MWC. This year 16 Washington companies made the trek to Barcelona, ranging from hard-core telecom players such as Orca Wave to more familiar mobile marketing and media brands like Hipcricket, Guppy Games|Media, as well as connected lifestyle companies like UI Evolution and INRIX. As adjunct faculty in the CommLead program, John du Pre Gauntt focuses on the production and strategy sides of multi-platform media experiences in his transmedia and independent studies courses. A journalist and market analyst by training, John’s analysis of the intersection of media, technology and economics has been featured by The Economist, Financial Times, eMarketer, GigaOm and the World Economic Forum.